On August 19, 2016, at 1130 eastern daylight time, a Piper PA-34-200, N16499, was substantially damaged during a forced landing near Hollywood, Florida. The flight instructor and pilot receiving instruction were uninjured. 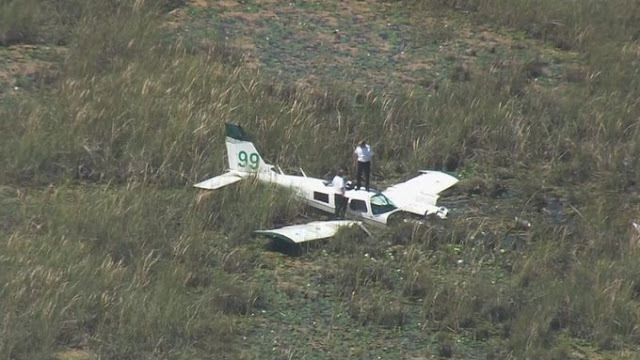 The airplane was registered to and operated by American Flight Training LLC. Visual meteorological conditions prevailed, and no flight plan was filed for the local instructional flight, which was conducted under the provisions of 14 Code of Federal Regulations Part 91. The flight departed from North Perry Airport (HWO), Hollywood Florida, about 1100. The purpose of the flight was to perform practice maneuvers in preparation for a multiengine instructor practical examination. According to the flight instructor, the pilot receiving instruction was at the controls and had just completed a right turn at an altitude of 3,300 feet mean sea level, when he heard a loud noise and observed something separate from the right engine. He took the controls and headed east toward the airport, when he noticed the airplane would not maintain altitude. According to the pilot receiving instruction, the right engine had partially separated from its mounts, and was angled downward. 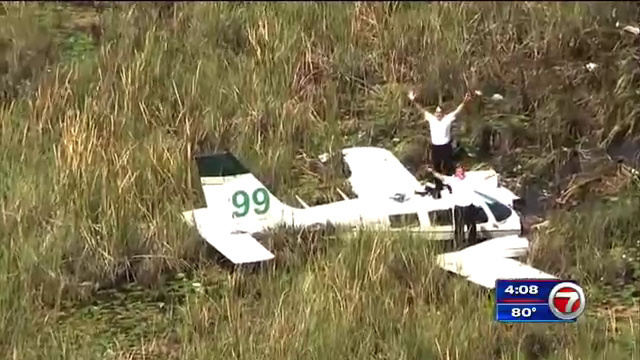 The instructor performed a forced landing to an area of tall sawgrass and shallow water. Examination of the wreckage at the scene by a Federal Aviation Administration (FAA) inspector revealed that the right engine had separated from its mounts and was found about 75 feet in front of the airplane. One propeller blade was missing and the propeller hub was fractured. The left wing trailing edge and aileron were substantially damaged. The empennage was buckled on both sides near the mid-section attachment point. Metallurgical examination of the right engine propeller hub revealed a features consistent with a fatigue fracture along a grease-fitting hole (for more information, see Materials Laboratory Factual Report for this accident in the NTSB public docket). An FAA airworthiness directive (AD 2008-13-28) had been issued on July 2, 2008 (and was superseded by AD 2009-22-03 on November 12, 2009). The 2009 AD required initial (within 50 hours time in service) and repetitive (every 100 hours) eddy current inspection of the area around the lubrication holes of the propeller hub blade sockets. The AD resulted from four reports of propeller hub cracks and was applicable to the make and model accident propeller hub. Maintenance records revealed that the airplane's most recent 100-hour inspection (which included inspection of both propellers) occurred on May 27, 2016, at which time the propeller installed on the right engine had accrued a total of 7,100 hours, with 380 hours since overhaul on June 2, 2015. The airplane flew about 60 hours since that inspection. Review of the maintenance records did not reveal any documentation that AD 2008-13-28 (or 2009-22-03) had been complied with on the overhauled accident propeller. 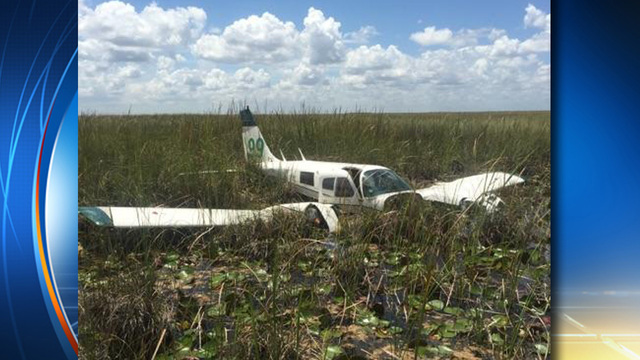 On August 19, 2016, at 1130 eastern daylight time, a Piper PA-34-200, N16499, was substantially damaged during a forced landing in the everglades near Hollywood, Florida. The flight instructor and pilot receiving instruction were uninjured. 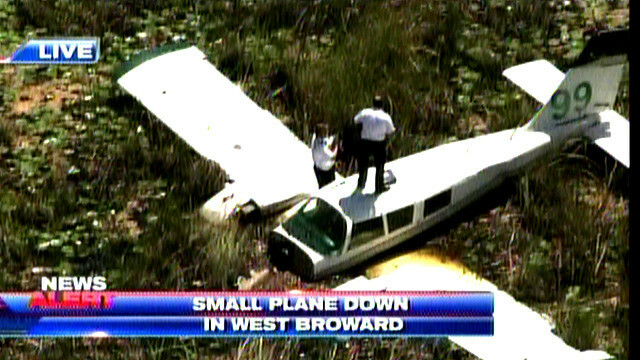 The airplane was registered to and operated by American Flight Training LLC. Visual meteorological conditions prevailed, and no flight plan was filed for the local instructional flight, which was conducted under the provisions of 14 Code of Federal Regulations Part 91. The flight departed from North Perry Airport (HWO), Hollywood Florida, about 1100. The purpose of the flight was to perform practice maneuvers in preparation for a multi-engine instructor practical examination. According to the flight instructor, the pilot under instruction was at the controls and had just completed a right turn at an altitude of 3,300 feet mean sea level, when he heard a loud noise and observed something separate from the right engine. He took the controls and headed east toward the airport, when he noticed the airplane would not maintain altitude. According to the pilot under instruction, the right engine had partially separated from its mounts, and was angled downward. The instructor performed a forced landing to an area of tall sawgrass and shallow water in the everglades. Examination of the wreckage at the scene by a Federal Aviation Administration (FAA) inspector revealed that the right engine had separated from its mounts, as was found about 75 feet in front of the airplane. One propeller blade was missing and the propeller hub was fractured. The left wing trailing edge and aileron were substantially damaged. The empennage was buckled on both sides near the mid-section attachment point. Maintenance records revealed that the airplane's most recent 100-hour inspection (which included inspection of both propellers) occurred on May 27, 2016, at which time the propeller installed on the right engine had accrued a total of 7,100 hours, with 380 hours since overhaul. The airplane flew about 60 hours since that inspection. The right engine and propeller assembly were retained for later examination. Not sure why a flight school wouldn’t replace the ad hubs with new non ad hubs. Cost is probably $5000 for two, including overhaul if blades pass. Sure you can go the recurring inspection route, which is in compliance but questionable based on history of hubs cracking. I personally would not operate this way. Sounds like a loser operation. People are not expendable.